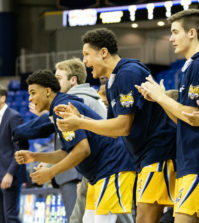 The one thing Quinnipiac head coach Tom Moore stressed the most at halftime during Saturday’s matchup against Fairleigh Dickinson was taking advantage of the first four minutes of the second half. 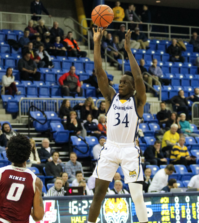 The Bobcats executed what Moore preached to perfection, opening the second half on a 15-0 run, sending the Bobcats (21-6, 13-5) to a 71-60 victory over FDU(5-24, 3-14) in the final regular season game. The run was ignited by Deontay Twyman, who finished the game with 12 points, five rebounds, and five assists. Twyman scored on a layup 26 seconds in, and then hit a 3-pointer just 18 seconds later. The trey put Quinnipiac ahead 36-28. 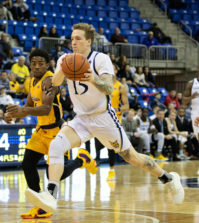 Along with Twyman, three other Bobcats reached double figures in scoring as James Johnson and Lance Brown finished with 13 and 12 points, respectively, and Justin Rutty collected another double-double with 14 points and 10 rebounds. Moore credited the evenly distributed offense to the way the team played on defense. After opening the game up with an 8-0 run, the Bobcats saw themselves trailing for the most part of the first half. With 1:20 remaining in the first half, Rutty scored on a jump shot which put the Bobcats ahead 27-26. As the final seconds expired in the first half, Rutty tipped in an offensive rebound as the buzzer sounded, giving the Bobcats a 31-28 lead into halftime. The Bobcats turn their attention now to the NEC playoffs, where they will be the No. 2 seed and face either St. Francis (NY), St. Francis (PA), or Mount St. Mary’s.